Bosch (Hieronymus) the Complete Works was written by Roger H. Marijnissen. 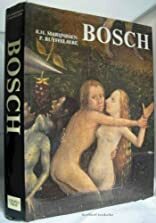 Bosch (Hieronymus) the Complete Works was published by Alan Wofsy Fine Arts. About Roger H. Marijnissen (Author) : Roger H. Marijnissen is a published author. Published credits of Roger H. Marijnissen include Bosch: The Complete Works.